Savante’s NEW scanning technology unlocks 3D forensic grade survey data using your existing video footage. Is your asset damaged ? Take control, React faster - Build an accurate 3D digital twin from your current footage and start engineering your repair solution…. today. …video and photographs only ALERT to a potential problem with your asset. Perhaps the asset has to be shut in? Lost production. Everything in this model is based on assumptions and a review of the video footage from a single ROV inspection project. Wasteful of time, resources and money, and choc-full of potential for miscommunication. How many inspection coordinators, drafts-persons, engineers at both ROV contractor, integrity management provider and and oil operator would you involve to get this far? How quickly can you respond? This project took two weeks and seven office-based contractors as part of an investigation. That was before a repair solution was even designed: We solved it in forty five minutes. The ROV inspection contractor report was also proven to be anatomically INCORRECT and INACCURATE !! Savante rapidly creates highly accurate, geometrically-correct 3D point clouds and models of whatever lies beneath the waves, using exactly the same video footage. Scroll down for examples of structural models. Savante’s disruptive 3D subsea scanning technology uses sparse and dense photogrammetry to solve your 4U problem. 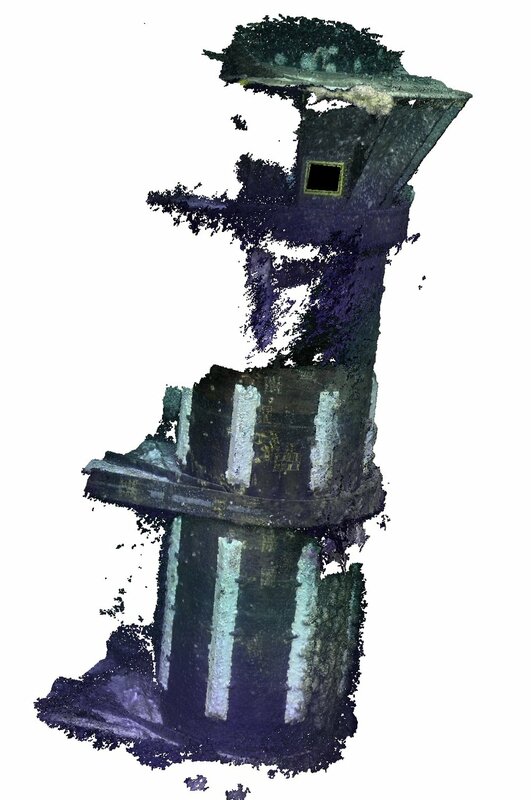 Savante creates an accurate and digital-virtual representation of submerged structures using a cloud of precisely-determined 3D points (a “point cloud”). These point clouds are of photorealistic quality, offering full colour and immense resolution: essential to detect structural issues such as corrosion or deformation.. Billions of times faster than a diver. Your data…. …our analytical abilities. Once a subsea-scanned point cloud has been captured, it can be exported into any CAD package to which a wide spectrum of engineering computational tools, such as finite element analysis can be applied. This is a critical Savante capability and proves useful in providing the necessary diligence and evidence to support cases for deferment or reducing the frequency of further inspection. “3D Subsea scanning facilitates an accurate and early assessment; enabling key and correct repair decisions to be made EARLIER." Savante operates the widest range of photogrammetry solutions and hardware. This ensures we can match the correct equipment to your measurement problem. With software capabilities including SLAM, structure from motion, stereo-imaging, trinocular imaging and laser dynamic mapping you can be assured that we will provide you with the greatest balance of flexibility, cost effectiveness and reactivity in our response to your problems. scalable technology means we can use the same equipment to survey close up for applications such as coating damage to full digital twins of entire platform jackets. We can perform 4D analysis by comparing successive survey data sets and inspecting deviations and difference models. Fully scaleable- 3D digital twins of small scale to complete structures. Savante’s hybrid of 3D subsea laser-scanning and photogrammetry techniques provides the best of resolution, repeatability and rate of data capture. Fully Dynamic - measurement from moving platform, moving target. 3D SLAM scanning and SfM techniques enables the capture of a digital twin model even when both the ROV platform and target material are in motion. This is called the moving platform, moving target situation. We don’t require motorised, encoded tripod stands or highly engineered mounting clamps to survey an area. We recognise that it is uncommon for a chartered GVI ROV spread to be pro-actively equipped with the latest in high performance metrology tools such as our latest 3D subsea laser scanning systems. Traditionally, some indications may warrant the immediate suspension of production and attention of an entire integrity and subsea department to fully investigate, develop task plans and potentially repair solutions that accomodate a wide range of assumptions. Savante’s video technology eliminates the warm-up time needed to create an accurate response. Our 3D modelling capabilities side-steps the time and money wasted by the physical interpretation of video data and drafting of 3D models. We can also save the need to redeploy a survey vessel with additional hardware. Trigger an immediate reaction - not all mobilisations are necessary. We can use your existing video cameras to collect the datasets necessary to create a high resolution digital model of your asset. This avoids the logistics of transporting equipment and specialist personnel around the world to your worksite. This saves on bed-space, visas and costs and the vital delay to your schedules. Savante can rapidly create a digital calibrated model of your camera system, accounting for lens distortions, refractive index of the seawater. Once this has been achieved all we can optimise the manner in which the ROV positions itself in order to collect the best quality 3D data. Whilst we are confident that our tried and tested 3D video and photogrammetry solutions can meet your immediate inspection needs, there are often projects where photogrammetry solutions fail terribly or are otherwise not practicable. These include surveys in areas of poor visibility or where access to view an important feature is not possible. operations in areas of turbid water where its not possible to cut down the range to the target, particularly where wellhead protective structures or perhaps within the structure of a jacket obstructs a work class ROV from getting in close. obstructions which prevent the ROV from getting a range of photographs of an object from sufficient different viewpoints. Perhaps the indication has been discovered deep within the structure of a xmas tree, restricting views to only a narrow cone or angles. In all these circumstances, remember that you are in the best of company and that Savante also offers the worlds widest range of subsea laser metrology, scanning, profiler, range-finder and image-scaling systems to do everything else. We also supply 3D from live video camera systems using stereo imaging and trinocular imaging solutions. Take a look at our product range and see if your future inspection projects may benefit from hiring or purchasing of our offerings. Sometimes it may be necessary to perform an investigation on an asset and it is impractical to send an ROV out to perform an inspection for reasons such as weather or non-availability of an inspection support vessel. Alternatively an inspection may be triggered by the sudden failure of a similar component or system elsewhere and you may be looking to perform a diligent survey across your remaining infrastructure without having to mobilise a survey vessel. Savante can work with legacy and archived video footage to create 3D digital models of your asset, sometimes going back many years to track the progression of an indication; whether simply monitoring the size of corrosion, a hole, a dent, a twist or wear and tear on a moving component. Image mosaics and wide area surveys from your rotten old obsolete PAL - NTSC camera? Situational awareness is not just about making 3D (or even 4D time resolved ) measurements. Our technology can also be used to provide a general overview of an area of concern using image mosaic technology. Individual frames of video footage or even a series of high resolution digital stills can be used to render plan and elevation views that cut through the limitations of poor visibility. The software retains the maximum useable data from within the field of view of your camera in each frame of video footage. Our mosaic technology does this for every frame, lifting the veil of fog created by poor visibility across your whole investigation site. The mosaic below was created in filthy turbid waters using only a PAL video colour camera. Concrete mattress used in a pipeline crossing construction. Recover 3D structure from your video footage archives. The image below also uses image mosaic technology to provide a general overview of the side an an FPSO. Click on the image to see it in greater detail. 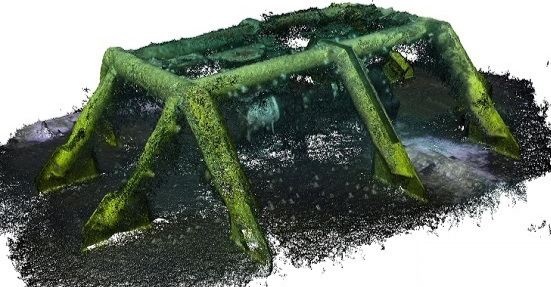 Savante's 3D photogrammetry software solutions can be used with video camera technology found on any ROV or diving spread to create full-colour, high-resolution 3D point cloud modelling in the underwater environment. It also works with legacy, historical and archived footage; typically provided by a PAL or NTSC standard video camera. Whilst not ideal, our software can minimise measurement errors which are fundamentally generated using these outdated video standards. In fact; all of the models shown on this web-page were created from PAL sources with mm-level measurement accuracies. Our key differentiator arises from our experience in ROV and saturation diving operations, combined with the fact that we wrote our software from scratch and can exploit the fundamental mathematics underpinning this technology to the fullest extent. It means we can tune, out-perform and survey all the difficult places others fail to reach. Savante can often eliminate the requirement to mobilise additional personnel or hardware; saving our clients significant costs, eliminating logistics and enabling truly immediate responsive support. No requirement for technicians or equipment to mobilise.